There are many aspects to the art and science of cartography which have been portrayed on postage stamps. 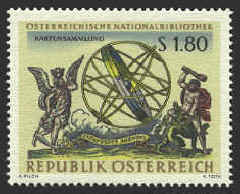 Among them the understanding of the world we live in as it is described by maps, and the development of the techniques and instruments to translate that understanding into visible form is well covered by the stamps issued by the nations of the world. While maps go back into the dim past, the history of cartography as an attempt to reflect the nature of the world really begins with Claudius Ptolemy, and continues into the 18th century. After that it is primarily a matter of detail. Some of the pages load slowly. That is because the pictures are large and have a lot of detail. I could have made them small and fuzzy but that would defeat the purpose of putting them on the Web at all. So, be patient.